Look for the Proudly Wisconsin Badge when shopping for cheese. Any brand of Wisconsin Blue can be used in this recipe. Melt 2 tablespoons butter in a 10-inch cast-iron or ovenproof skillet over medium heat. Add pears; cook and stir for 3-5 minutes or until tender. Remove pears from the skillet; keep warm and set aside. Wipe out skillet. Place skillet in the oven on the middle rack. Melt 3 tablespoons butter in a small bowl in the microwave. Beat eggs in large bowl until blended. Beat in the butter, milk, flour, cornmeal and salt for until frothy. Remove skillet from the oven. (Pan will be hot!) Add the remaining butter; tilt pan to coat bottom and sides with melted butter. Pour batter into the hot skillet. Sprinkle with bacon. Bake for 22-27 minutes or until puffed and edges are golden brown. 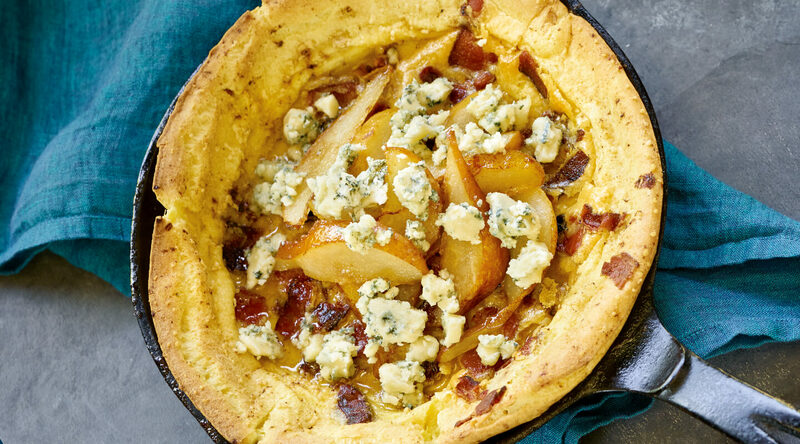 Spoon reserved pears into pancake; sprinkle with blue cheese. Serve warm.